Everyone needs a good poop. Daily is a must. Two times is better. Three times would be awesome, but who has the time for that? A healthy bowel movement should be hearty in width, solid, easily evacuated with minimal wiping. Too much poo talk? Everybody does it. Can we really just keep talking about what we’re putting in our bodies without touching on what’s coming out? The transit time for food in the system should ideally be no more than 24 hours with a perfect time of about 16 hours. The transit time is the time it takes from eating the food to eliminating the waste. Most people have a transit time of 48 hours, or even up to one week. This means that even if you consider yourself regular and you go everyday, waste can still be sitting around in your body for much longer than is healthy. Going everyday, doesn’t necessarily mean you are clearing out yesterday’s waste. Let’s pretend you ate a burger last night for dinner and you won’t be pooping out the waste from that meal until tomorrow. That’s 48 hours. Now imagine taking that same burger and shoving it through 30 feet of garden hose. (That’s about the equivalent of our small and large intestines combined.) Leave that hose out in the hot, hot summer heat for two days. (Body temperature is 37° Celsius, or 98.6° Fahrenheit.) What do you think will come out at the end of that time? Not only will this create discomfort and intense odor, but food that putrefies in the stomach, colon, or intestines creates a breeding ground for viruses, bacteria, and tumors. When we eat a heap of meat, we overwhelm our digestive systems and don’t clear it out efficiently. Part of this cycle is that meat and other animal foods have been linked to an increase in constipation. This is due to both the energy needed to properly digest and assimilate meat and also the connection that high meat diets are lower in fibre. Fibre is only found in plant-based foods. Animal foods have no fibre at all. We need high amounts of fibre and water in order to poo properly. Other cork-in-the-bottom foods include white flour, cheese, fried foods, sweets, salt, beef, pasteurized milk, junk food, wine, carbonated drinks, and coffee. – Two table spoons of ground flax or ground Salba (chia seeds) in unsweetened apple sauce before bed with 1-2 glasses of warm water. 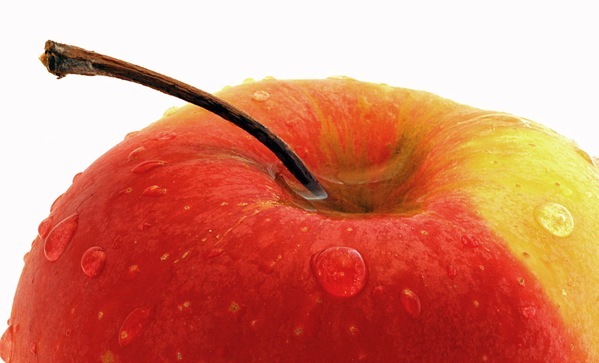 Apples contain pectin which will add bulk and their cleansing action will encourage bowel movements. They have a gentle laxative effect. – Water will become gelatinous as the mucilage properties are released from the seeds. This will help lubricate the walls of the intestine. This mucilage feeds and helps the cells of the intestinal lining. Image courtesy of Robert Molinarius.